I don't get to go out and ride dirt bikes as much as I'd like. I'm sure I'm not the only one out there that feels that way, too. But, when I do get to ride in the sand or the mud, there's always the day after that I don't look forward to. If you're tired of the black and blue marks on your inner thighs from the rough terrain, you might look at getting some shorts like these. These Troy Lee Designs Adult Undergarment Body Armor Shorts are designed to protect you when you don't want to throw on a big bulky pair of pants. These fit easily under a pair of jeans, and when wearing them, you don't feel like you've got a big diaper on either. They're constructed out of premium Lycra 4-way stretch anti-microbial material which is moisture wicking. Besides having CE-rated armor and being made out of quality materials, one of the things that works really well is the integrated crotch pad, because it's sized and designed for motorcycle seats. It doesn't feel like you're just wearing a jockstrap and a cup. 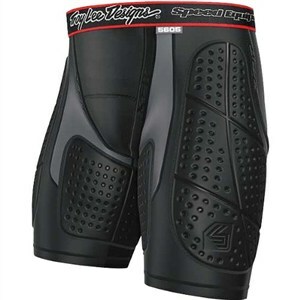 These probably aren't something that you're going to wear on a ride down the freeway, but if you've got a dirt bike that likes to get dirty every now and then, these Body Armor Shorts will help keep you from bruising up when your back wheel hits a big bump.